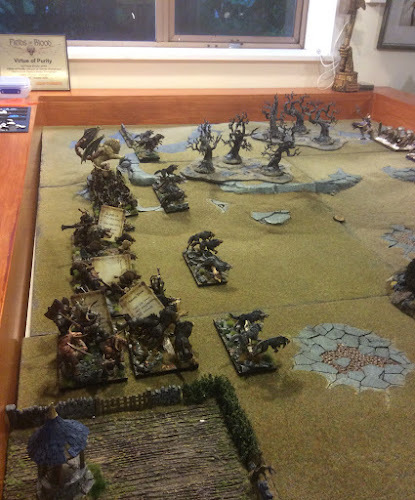 On Sunday morning I managed to get in a game with Ryan ahead of next weekend's WSS-Summer tournament. Ryan hasn't played under the new CoK rules and was keen to test his list before it had to be submitted. We decided to play "Loot" which is one of the missions this week. 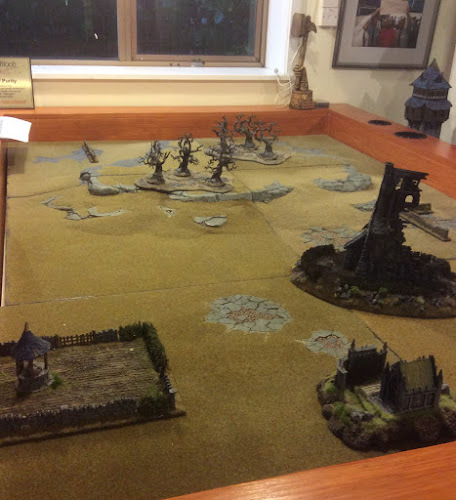 The battlefield had the requisite number of terrain pieces as prescribed in the map pack (though again the set up was influenced rather than dictated by the Norwegians. My set up is below. You can see my Magic Cards identifying the items the units are carrying. One counter is between the two woods, one in the centre and the third is out of picture in the foreground. 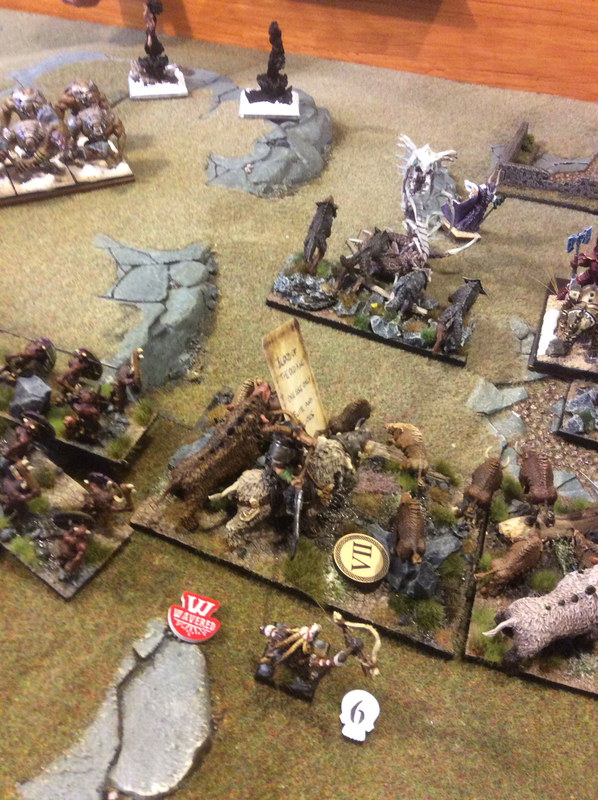 Ryan has two Hordes of Direfangs in the middle, Trolls, Wolves and a Chieftain on Direfang at the top. Between them is a Magos, two Magos Conclaves and a Cavern Dweller. 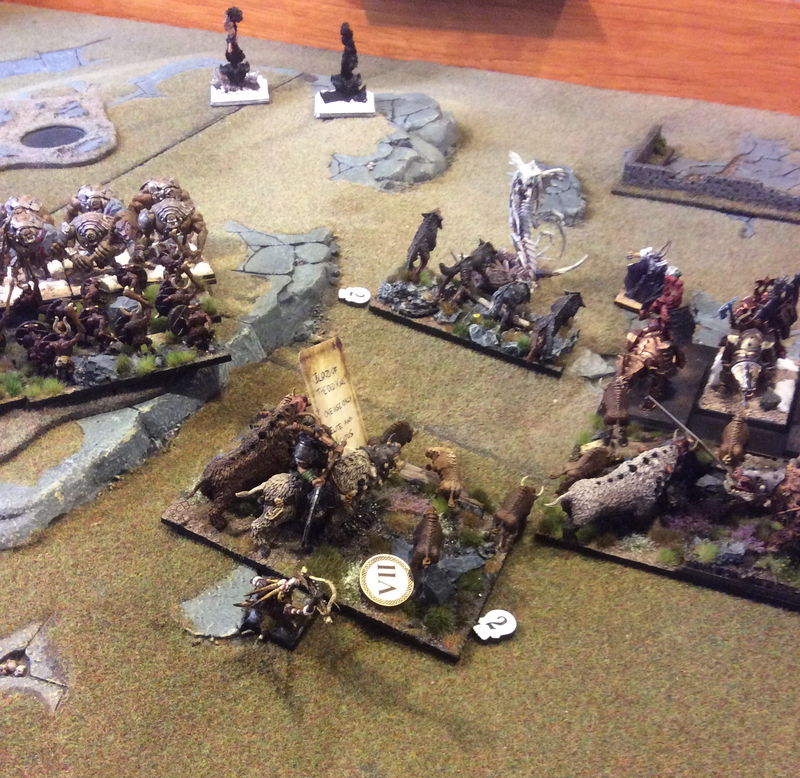 In the foreground he has a Bloodsworn Horde, a Skald and some Wolves. Ryan took first turn and the Magos Conclaves removed a Beast Pack. 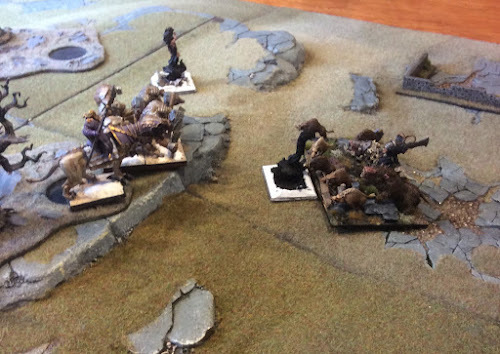 He advanced his Wolves up to take the counter. The centre and my left flank saw a slow advance. 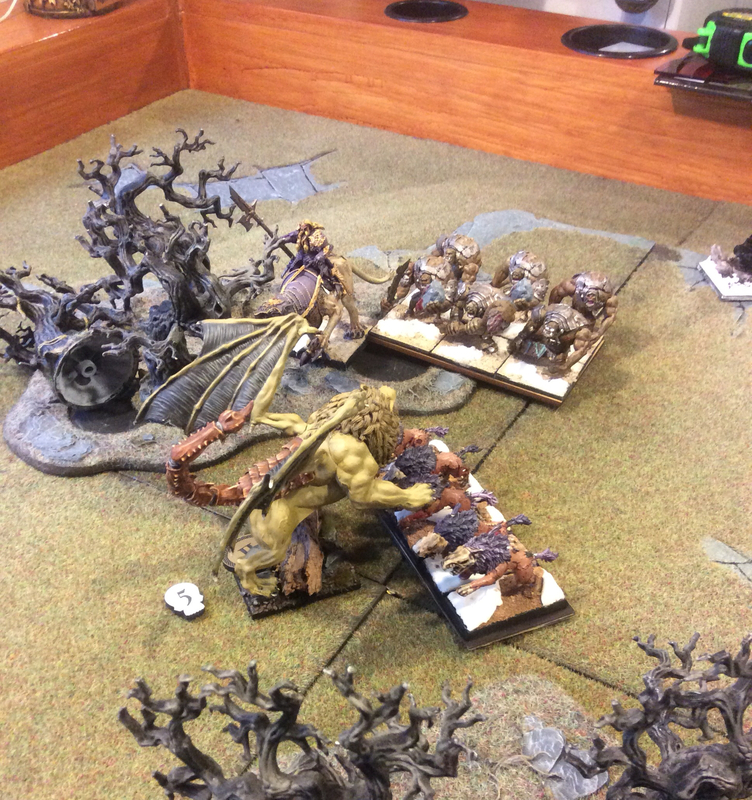 In my turn I threw the Beasts in front of the Chieftain and Trolls and put the Chimera on the token. 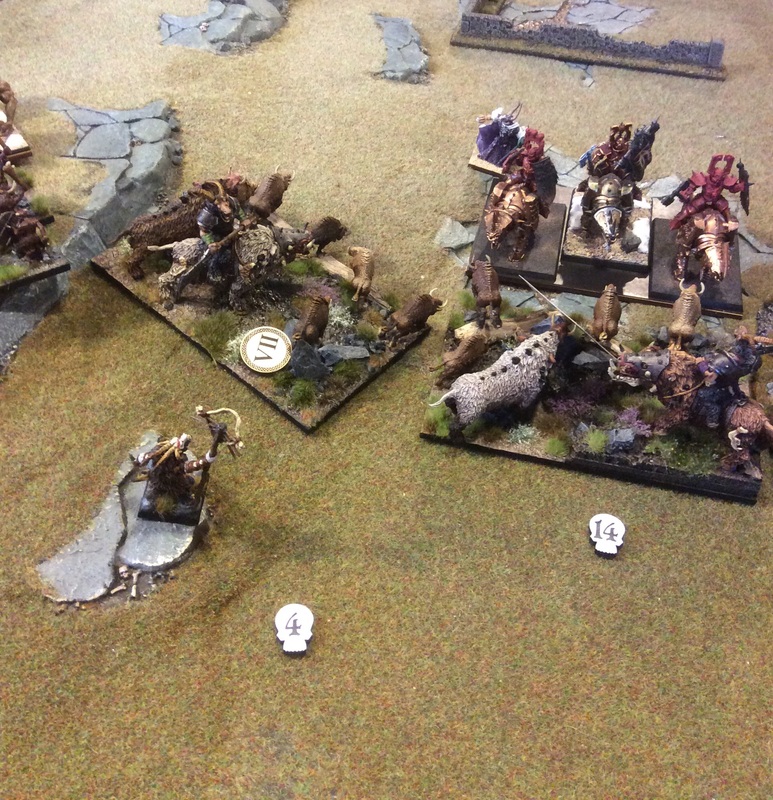 My plan was to try and tie up on this flank while I took the centre and token in my right. Not unsurprisingly the Beasts were removed. 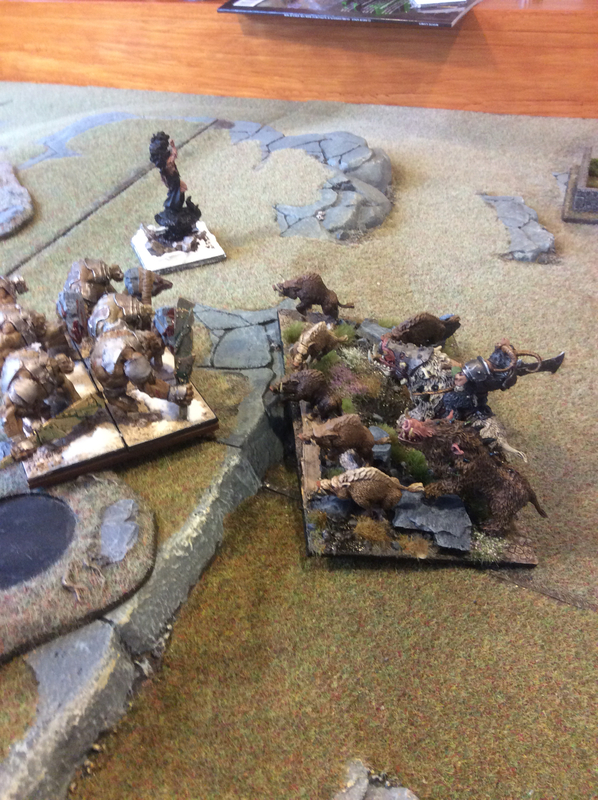 I was a little disappointed that the Chimera took 5 wounds from the 10 attack wolves. 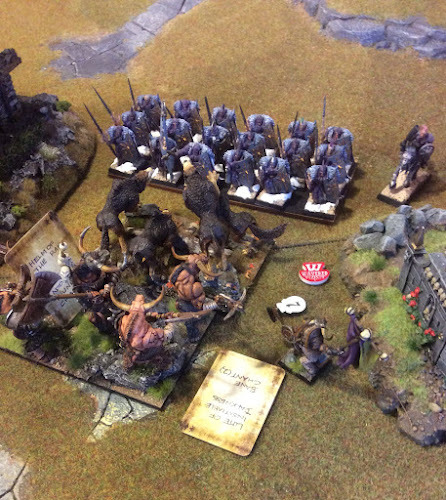 In the centre I committed the two remaining Beast Packs to a role of screening the front of the Stampedes. My intention was to take the right counter. Ryan's Wolves dropped it for the Bloodsworn to pick up. 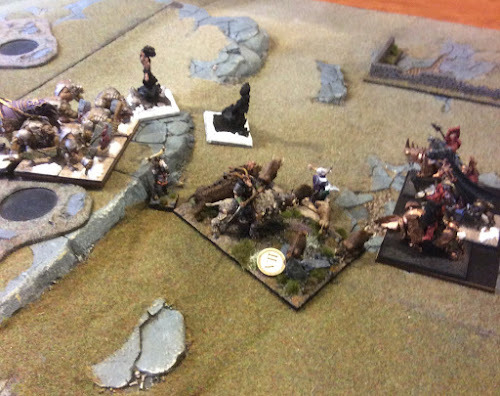 I had two Hordes of Lycans (one suspiciously looking like Were-cows) backed up by my ASB. The first job was to clear out the Wolves which they duly did. 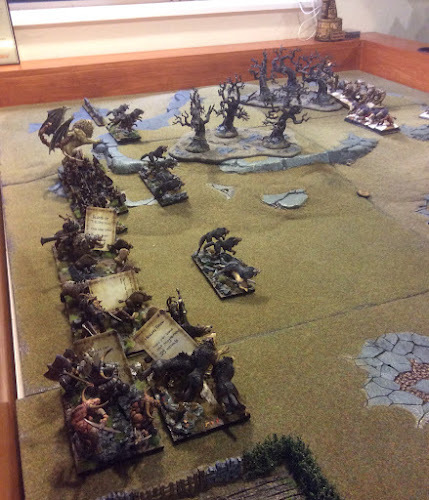 I began to push the centre with Beast Packs sitting in front of the Cavern Dweller and the first Direfangs. They were positioned so that the second Direfangs did not have the room for a combo charge. You can now see the wavered Stampede who will now not be able to charge the Cavern Dweller. Fortunately for me the luck swung the other way and the Cavern Dweller only wavered the Beast Pack. Ryan's Chieftain got into the flank of the Chimera popping it. To counter this I had turned my Spiritwalkers and parked them in terrain. The next turn saw Ryan charge my Stampede (held) and the Beast Pack (routed) The Spiritwalkers took a charge from the Trolls and Chieftain (held). I had a choice to make here when it came to spells - heal the in-combat Stampede, Bane Chant it or heal the Spiritwalkers. I chose the latter as it was important to keep them in the Fight. I made an error here. I didn't want to Countercharge the Trolls as I wanted them to remain Hindered. However even though I didn't have Thunderous I probably should have charged the Chieftain. With 35 attacks I should expected to do 6 wounds to him. 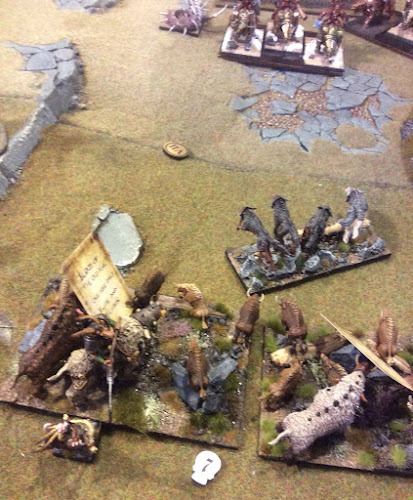 You can see Ryan's Wolves have picked up the Loot token. On my right things are not going well. The Bloodsworn waver the Lycans stopping the countercharge. 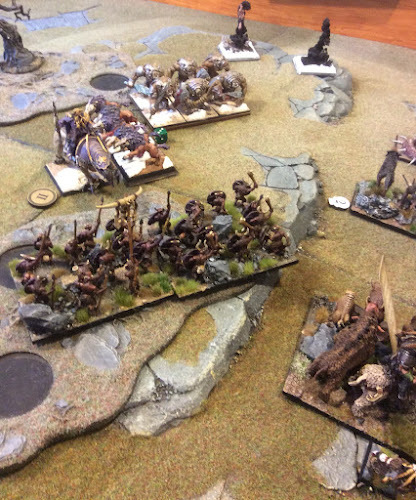 My Waver continues with the Direfangs wavering the Stampede and the Spiritwalkers holding again. The Cavern Dweller will now get a Stampede charge. Which routs him. 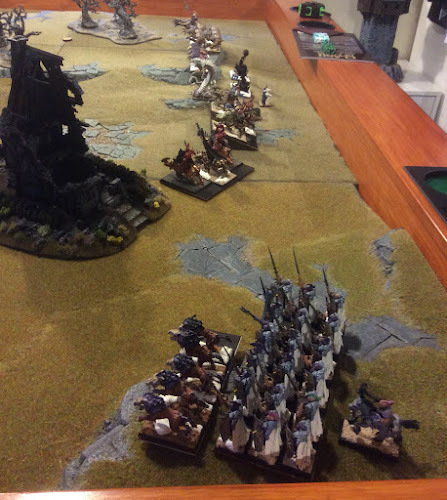 I regroup to threaten the flank of the Direfangs. You can see the Loot counter I picked up earlier. 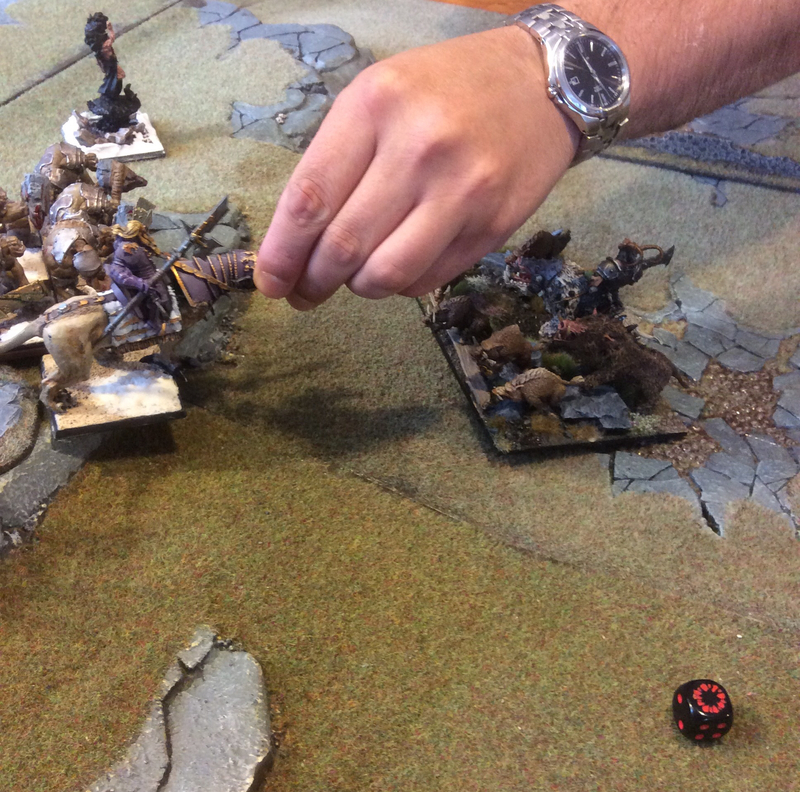 On the right the Bloodsworn have routed the first unit of Lycans but the second has now gone in wielding the Helm of the Ram. I failed to get Bane Chant off. 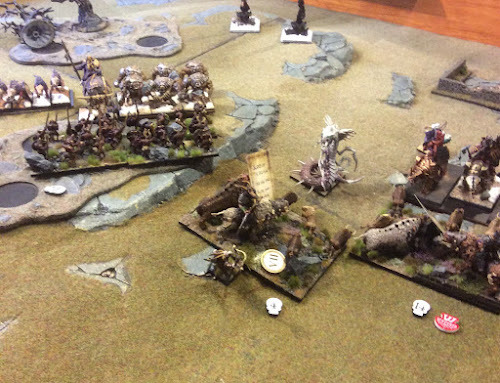 Prior to the Fight the Bloodsworn already had 7 wounds. 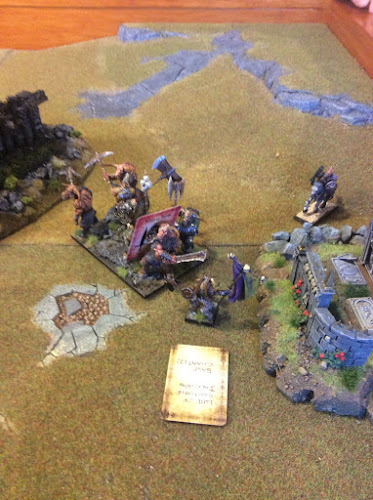 The Magos had charged the Stampede in the hope of removing Thunderous but with a single attack that was always going to be chancy. It did no wounds. 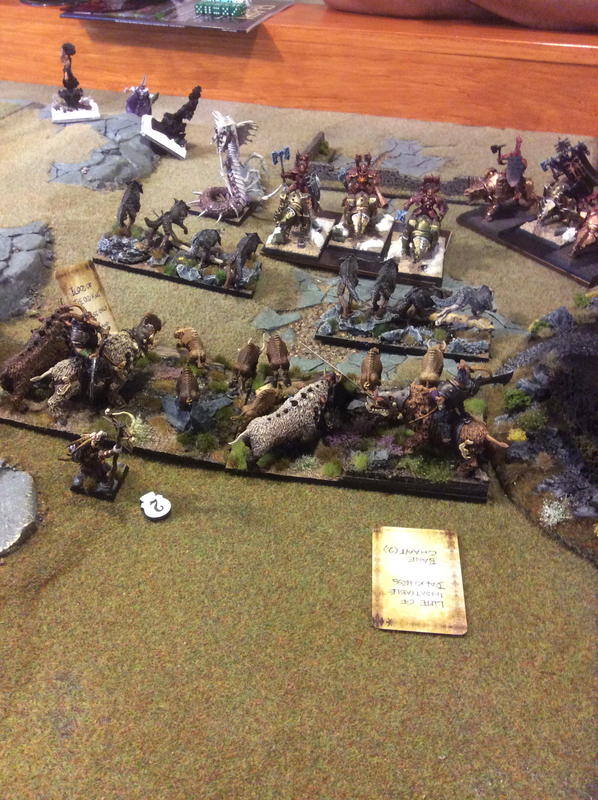 The Direfangs finished off the first Stampede and Trolls and Chieftain the Spiritwalkers. My Shaman has moved to impede a charge on the Stamped once it kills the Magos and overruns into the Direfangs. 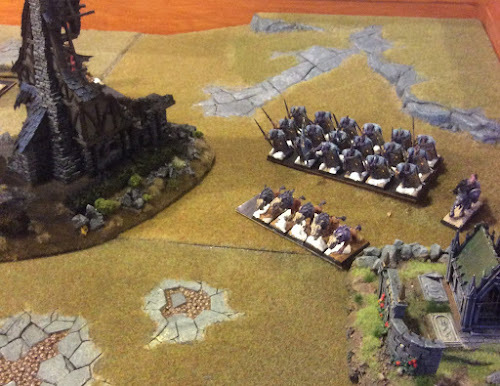 The Stampede removes the Direfangs and are placed so that the Trolls and Chieftain will need 6" overrun to hit Stampede. 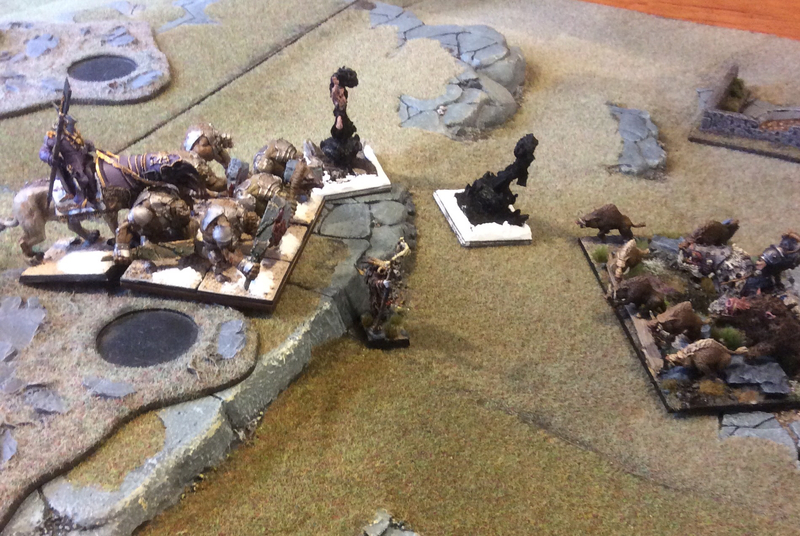 On the right the Were-Cows have routed the Bloodsworn and taken the Loot token putting me 2-1 up. Unfortunately I can only move 5" so aren't going to be able to get back in the game. 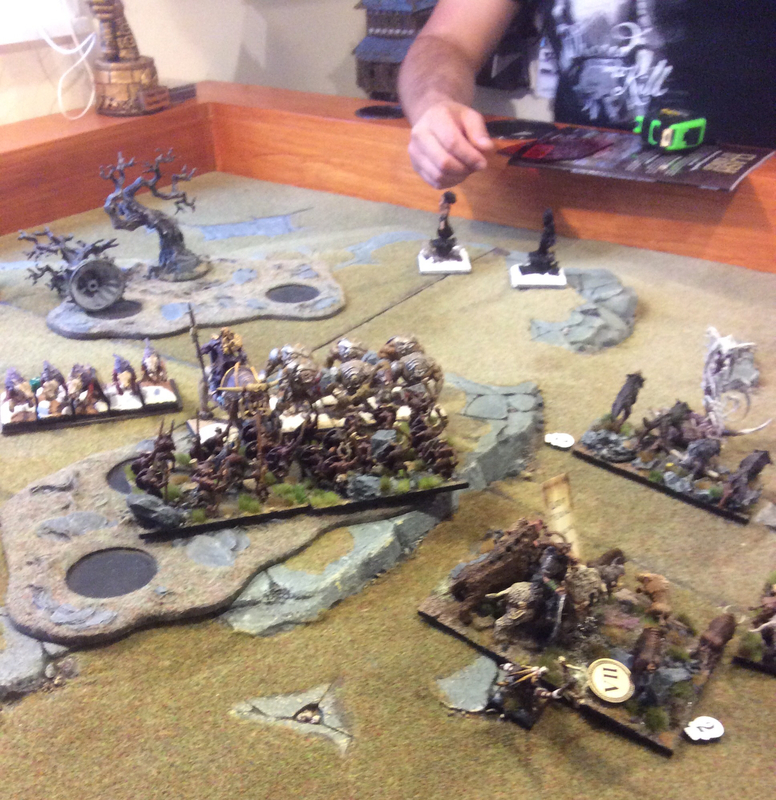 The Chieftain and the Trolls saw off the Shaman and Ryan decided to play for Turn 7 by putting one of the Conclaves in front of the Stampede. On my Turn 6 I charged it. On the right the amble continued as my Were-Cows tried to get back to the centre. 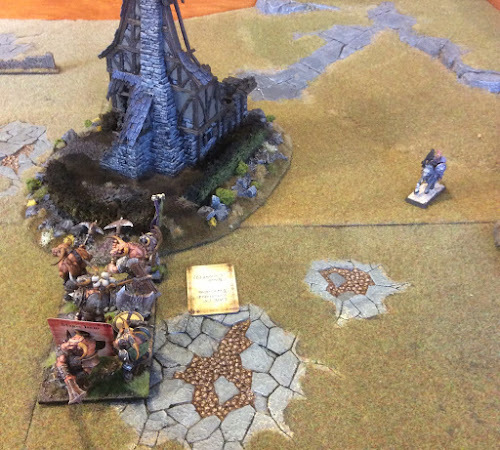 The Stampede routed the Conclave and were 6" from the Trolls and Chieftain. 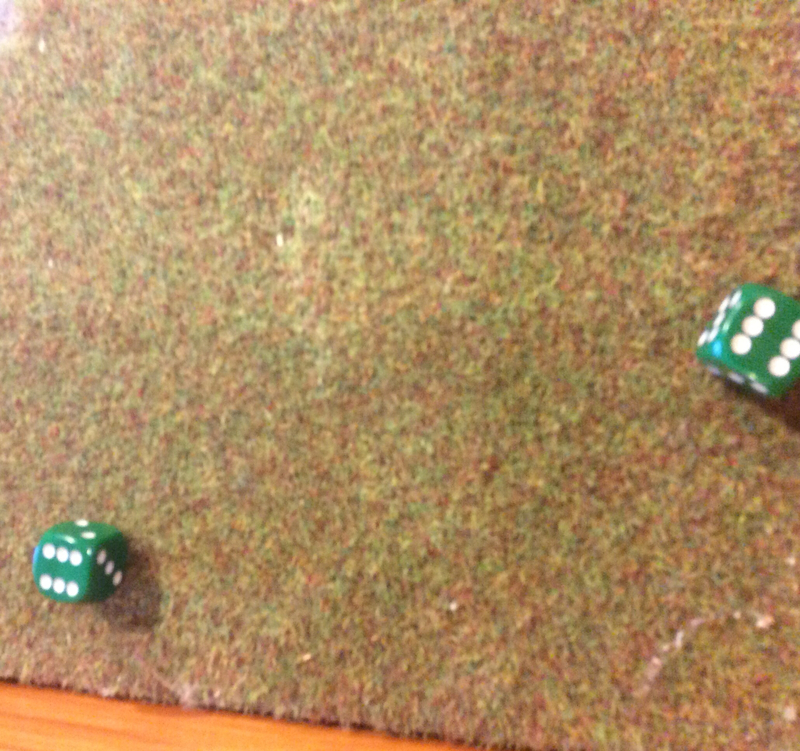 I rolled and you can see the result in the foreground. I went into the Chieftain and did 13 wounds. He routed after the re-roll. 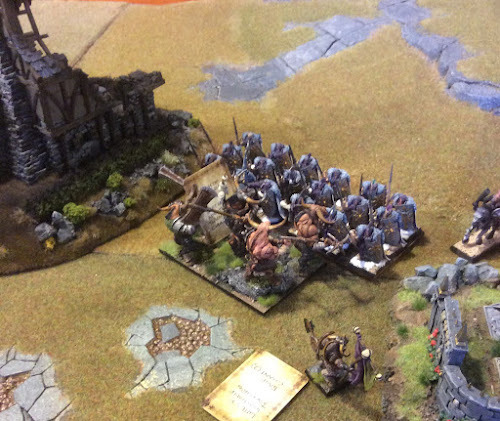 The Stampede was positioned so any charge from the Trolls would remain Hindered. 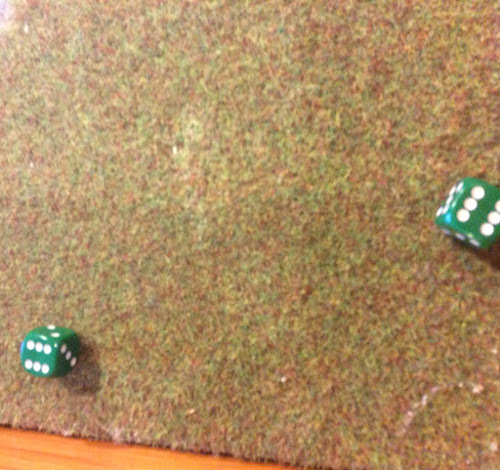 We rolled for Turn 7 but it wasn't to be. I double the Hindered Trolls could have broken the Stampede, needing a minimum of 10 wounds out of 18 attacks, hitting on 5+. So The Herd managed a 2-1 victory and had between 550-600 points left. 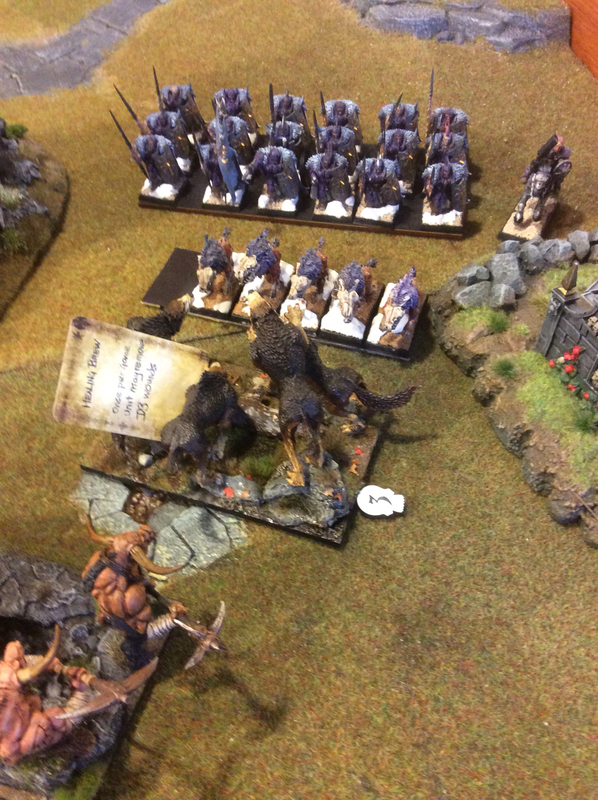 The Varangur were about 50-100 points less. Overall a very tight game that could have gone either way. I was way happier with my deployment- I've been drawing up different deployment strategies over the week - and with my decision-making. 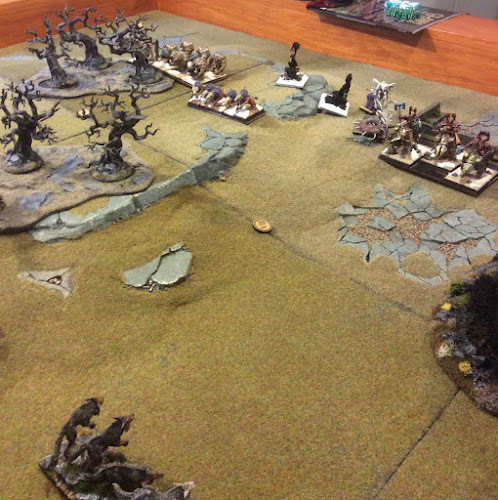 The one mistake I made (twice) was not charging the Chieftain with the Spiritwalkers. Works okay for me. Are others having issues?